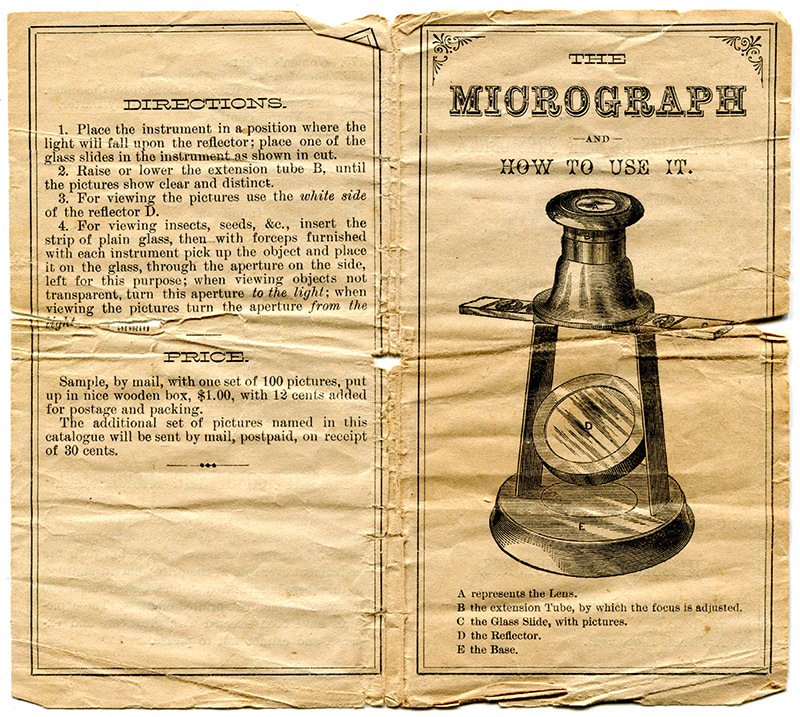 The Micrograph was a small, inexpensive, simple microscope made of stamped tin, sold in the USA from the late 1870s through the end of the 1880s (Figures 1-2). It has a single glass biconvex lens, mounted in a tube that can be adjusted in height for focusing. 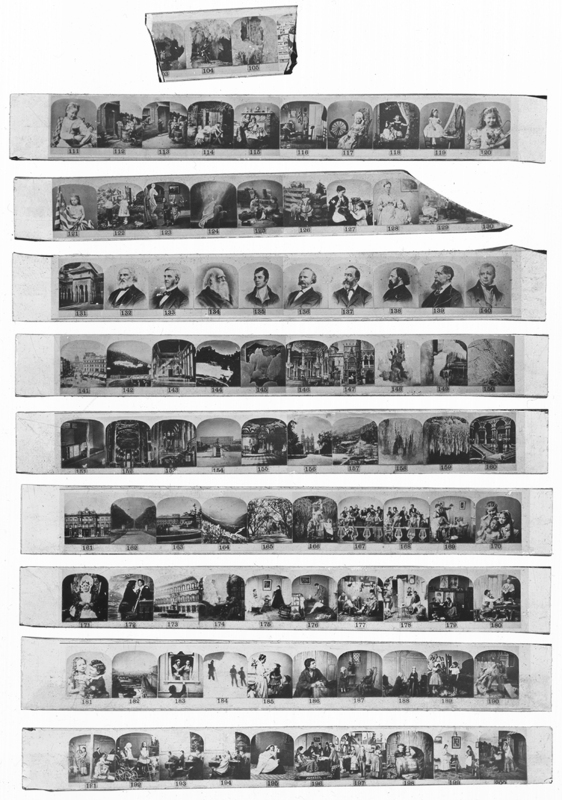 Its primary use was to view small photographs that were mounted on strips of glass, with ten pictures per slide (Figures 3-7). 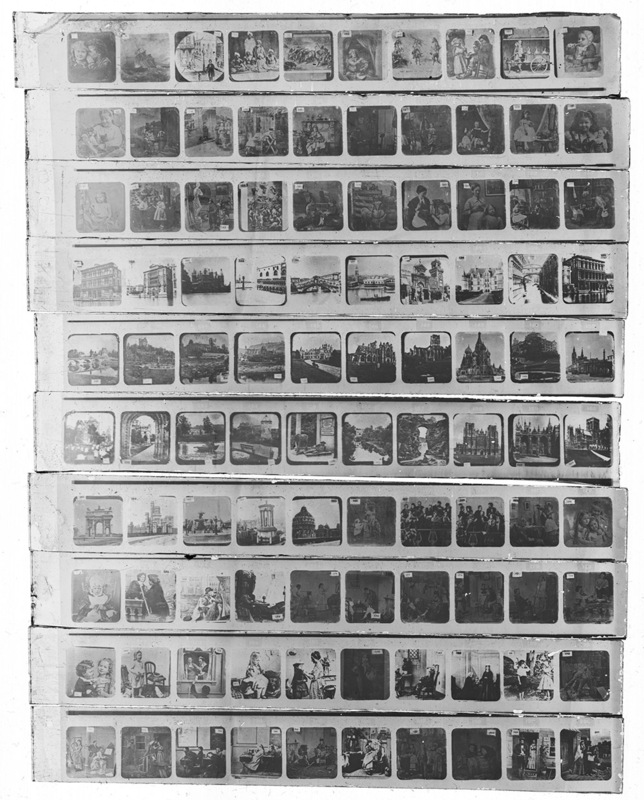 Although these were described as “microphotographs”, the images were many times larger than the famed microphotographs made by J.B. Dancer and others (Figure 4). It is also possible to use the Micrograph to view other microscopic objects, with light reflected from the mirror illuminating transparent objects, and a cut-out in the side allowing light to shine on opaque objects. Figure 1. An surviving Micrograph. It is a simple microscope, with a single lens mounted in the eyepiece. A mirror reflects light up for transparent objects (including the accompanying small photographs on glass slips), while a cutout allows top-lighting on opaque objects. Glass slides fit through a pair of slots under the eyepiece. Micrographs were sold by mail-order from the maker and a number of novelty retailers. They were also offered by magazines such as The American Agriculturalist, provided as premiums to people who enrolled new magazine subscribers. The inventor of the Micrograph, and probably its manufacturer throughout its production period, was Dwight Lyman Smith, of Waterbury, Connecticut. 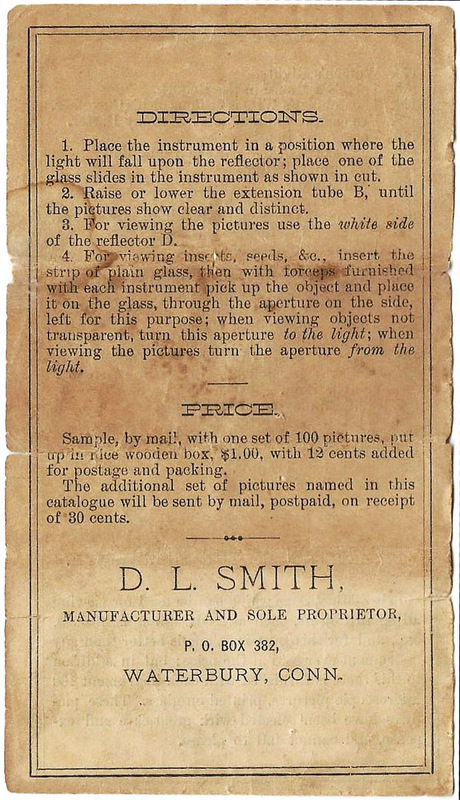 Some of the booklets that accompanied Micrographs stated that Smith was the instrument’s "manufacturer and sole proprietor” (Figure 9). Additionally, he is the only private citizen known to have advertised sale of the Micrograph (Figure 10). During the time of its production, Smith was superintendent of the Waterbury Buckle Company. This town was renowned for its metalworking businesses, to such an extent that it was known as “The Brass City”. 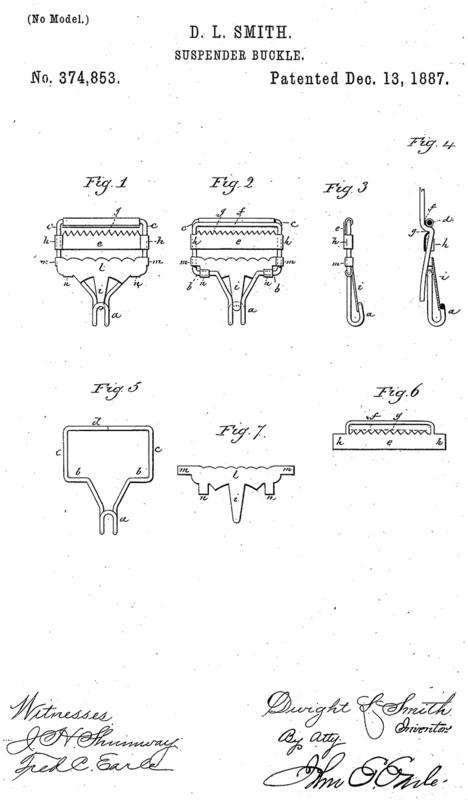 Smith was awarded numerous patents for various buckle devices made from stamped sheet metal. 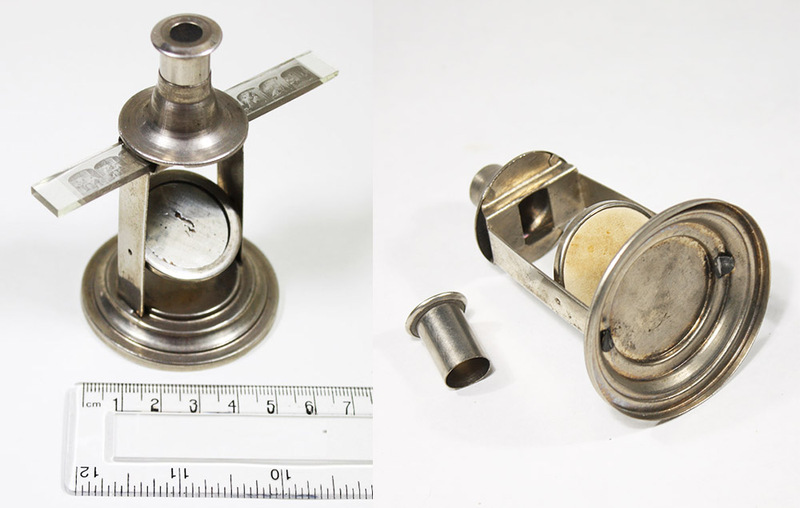 He also patented and marketed a brass-plated tin compass/sundial in 1870 (Figure 14). A brief biography of Smith was included in an 1889 book, The Town and City of Waterbury, Connecticut: “Dwight Lyman Smith, son of Lyman P. and Marilla Smith, was born in Waterbury, March 4, 1839. He was educated in the Waterbury schools. He worked at first for the Hotchkiss & Merriman company, when they manufactured suspender buckles. When the business was merged into that of the Waterbury Buckle company, in 1855, he was employed by the new concern, and has been connected with it, with short intermissions, ever since. He has been for the past twenty-eight years superintendent of the factory of the Buckle company. In 1862, Mr. Smith married Helen M., daughter of James Latta. They have two children living, Albert and Idella”. Census records indicate that the Smiths lived quite well, consistently employing a domestic servant. Dwight Smith died on December 17, 1905, at the age of 66. Figure 2. The Micrograph is rather small, the base being about 2 inches / 5 cm in diameter, and standing about 3 1/4 inches / 8 cm tall. They were made from cut and pressed tin sheet, with the various parts fastened together by tabs that fit through slots, then bent over. The eyepiece consists of a cylinder of tin with a biconvex glass lens mounted in a tin disc. Aside from cutting and stamping the metal, no particular skills would have been required to assemble a Micrograph. Except for the lens and the mirror, Smith could have easily produced all of the components at his Waterbury Buckle Company, or at one of the many other local metalworking businesses. Figure 3. Three boxes of glass-mounted photographs for the Micrograph. 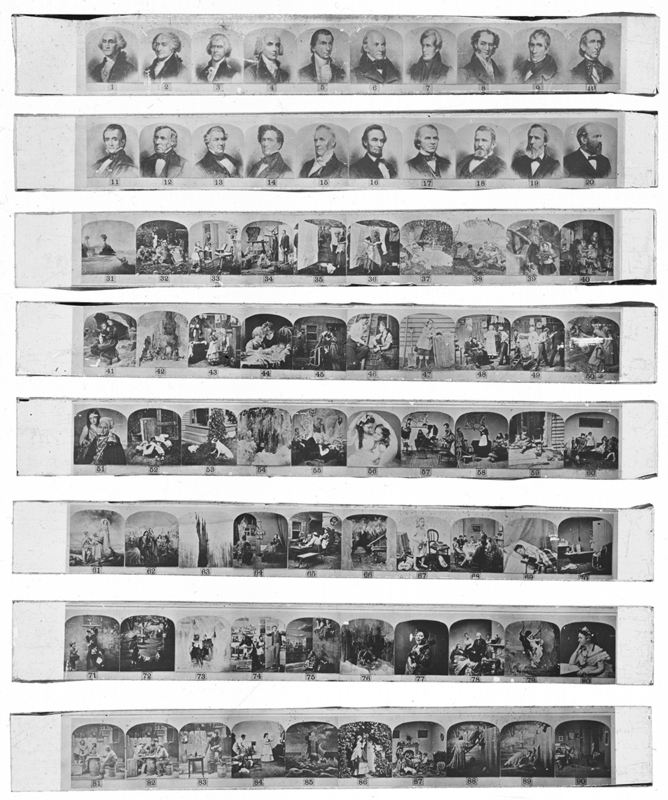 The phrase “stereograph” on the center and right boxes is misleading, as it is impossible for the individual images to produce stereo views. The monocular Micrograph is incapable of stereo vision. Figure 4. The glass-mounted photographs for the Micrograph are substantially larger than the true microphotographs of J.B. Dancer. Figure 5. Eight surviving slides from the center box shown in Figure 3, numbers 1-100. 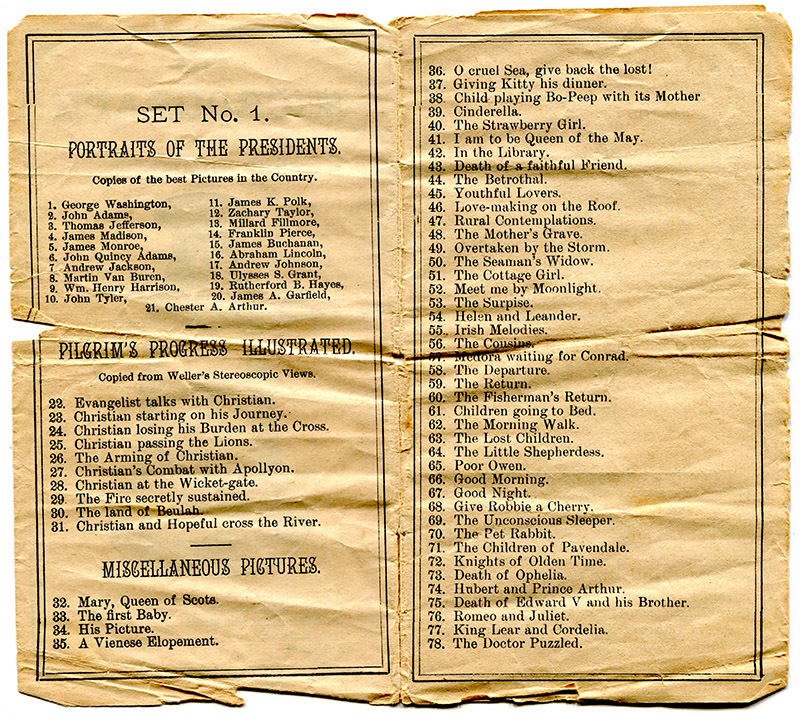 The first two slides show the first twenty Presidents of the USA. The twentieth, James Garfield, was elected in 1880, and assassinated in late 1881, thereby dating this set to a narrow time range. Other sets are known that end with the nineteenth President, Rutherford B. Hayes (served 1877-1881), and the twenty-first President, Chester A. Arthur (served 1881-1885) (see Figures 8 and 9). Figure 6. Nine and a half of the slides from the right-hand box shown in Figure 3, slides 101-200. Figure 7. The ten slides from the left-hand box shown in Figure 3, slides 101-200. The style of the slides and the box indicate a different period of production that the slides shown in Figure 5 and 6. Figure 8. 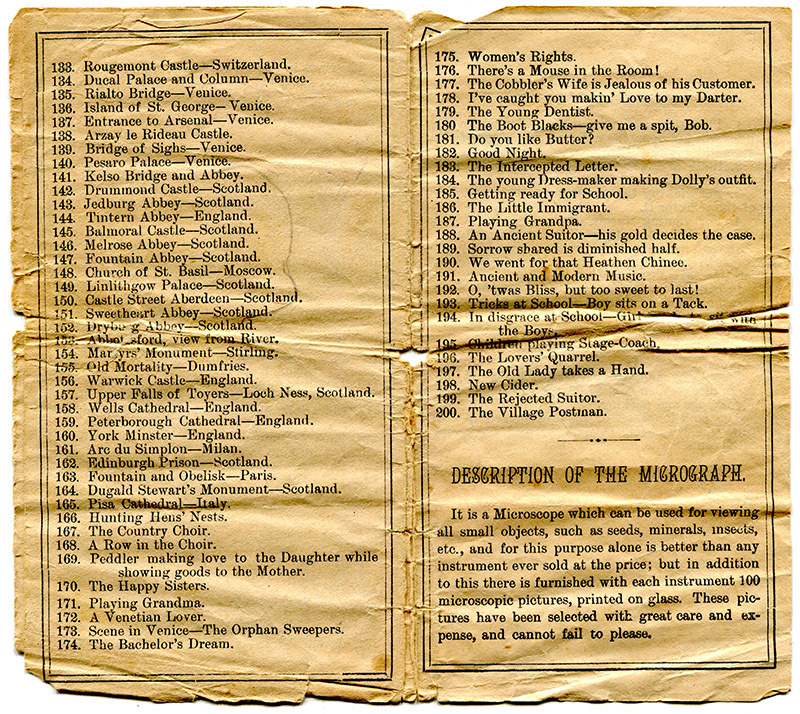 A booklet that accompanied a Micrograph, describing its use, and listing the titles of the accompanying photographs. This booklet lists Presidents up to James Garfield, dating it to 1880-81. With a few exceptions, the titles correspond with images on the slides shown in Figures 5 and 6 (some obvious differences being the slide with images 131-140, which show pictures of men, whereas the list described scenery, and the woman in image 80 is surely not “the weary peasant boy”. Contents evidently varied over time). The blank space on the back cover (top image, left side) was for printing the distributor’s name and address. Figure 9. 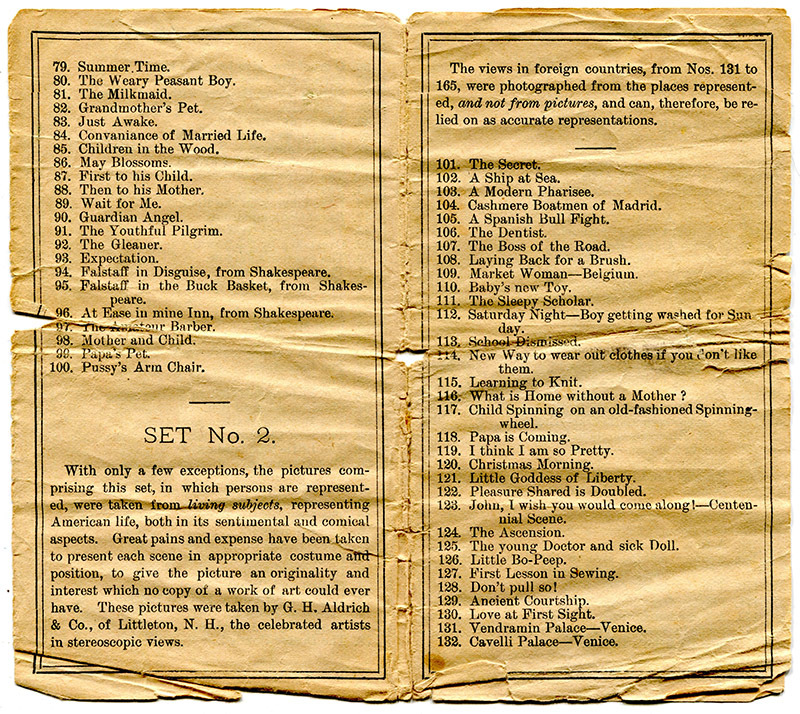 The back page from another Micrograph booklet, printed with Dwight L. Smith’s name and address.. Figure 10. Two advertisements from Dwight L. Smith. From “Scientific American” (left) and “The Youth’s Companion” (right). Figure 11. 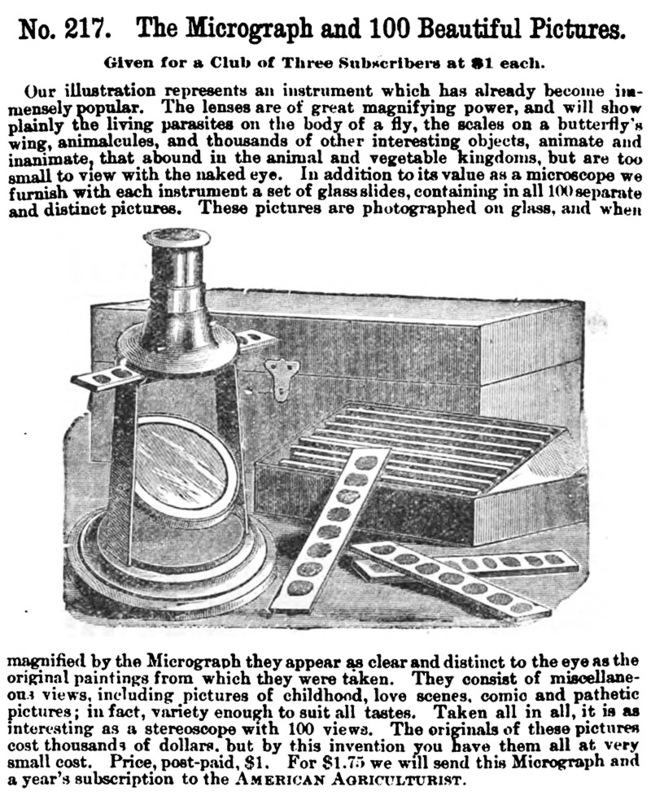 One of the microscopes advertised in A.H. Andrews & Co.'s 1881 “Illustrated Catalogue of School Merchandise”. That company was based in Chicago. Figure 12. A full-page advertisement for the Micrograph, from the New York-based World Manufacturing Company. That mail-order firm sold a wide variety of novelties and other items. 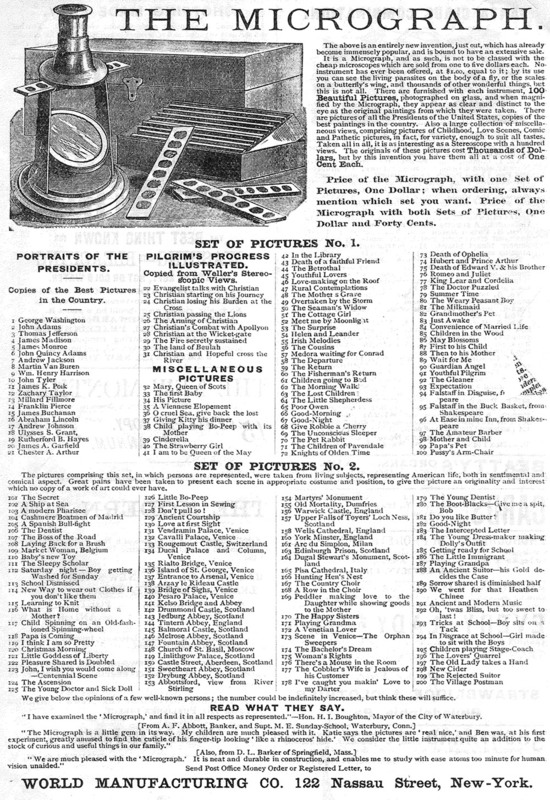 The source of this advertisement is not known, but this list includes Presidents through Chester A. Arthur, and thus dates between 1881 and 1885. Figure 13. An 1889 advertisement from “The American Agriculturalist”, who offered the Micrograph as a premium to people who brought in new subscribers. Figure 14. A “Magnetic Tide Keeper and Compass”, patented in 1870 by Dwight L. Smith. It appears to be made of brass-plated tin. Adapted for nonprofit educational purposes from an internet auction site. Figure 15. One of Smith’s many patent applications, in this case, an 1887 suspender buckle made of stamped sheet metal and bent wire. Surprisingly, nobody seems to have patented the Micrograph. Thank you to Joe Zeligs for sharing images and for constructive comments on this essay.